The Samsung Galaxy E7 comes with a 5.5-inch display, the largest in the E-series lineup. Its resolution is 720 x 1,280 pixels and that amounts to about 267ppi - not particularly impressive but still acceptable. After all, a FullHD Super AMOLED panel would have meant a higher price tag and also might have eaten into the Galaxy A7's sales. The screen delivers vivid colors, as expected from Super AMOLED, but there aren't different color modes as in higher-end Samsung devices. Most target users will be happy with the default punchy output, though. The Galaxy E7 lacks an ambient light sensor, and the brightness of the display can only be adjusted manually with a slider. You do get an Outdoor mode, which you have to enable also by hand. The setting overrides the slider and takes the brightness up a notch from its regular maximum illumination. The Outdoor mode remains on for 15 minutes, and if you happen to still be using the phone after that period has elapsed, it'll remain on, until you send the phone back to sleep. It's not an exact replacement of a proper ambient light sensor, but it's something. Another setting claims to adjust the screen brightness according to the displayed content in an attempt to conserve power. There's also the Smart stay feature which utilizes the front camera to keep the display on while you're looking at it. A glove mode is also enabled to increase touch sensitivity for those cold winter days. 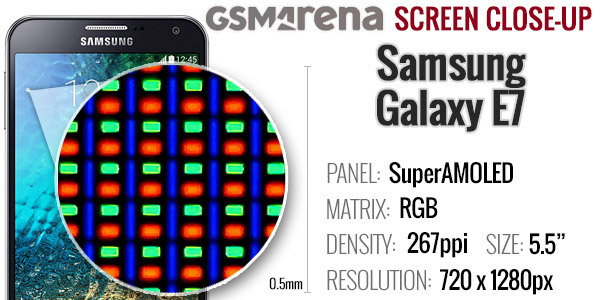 The SuperAMOLED screen on the Galaxy E7 makes use of an RGB pixel arrangement, which features a green and red subpixel plus a taller, but thinner blue subpixel. It's the same pixel arrangement that we've seen on the Galaxy Note II N7100 back in 2012 and on the Galaxy A3 earlier this year. The reason for the different Blue pixel size is that the blue subpixels on AMOLEDs typically have a shorter life and making them bigger balances things out. Being bigger, the blue pixel doesn't need to emit as much light to match the other two, which helps it last longer without affecting color balance. The Galaxy E7 proved very bright indeed. With Outdoor mode enabled brightness reaches upwards of 500nits, on par with the Galaxy S5 and therefore very bright for an AMOLED panel. The 50% setting is more like 40% of the maximum brightness, pretty good in a world where linear adjustment sliders are getting increasingly rare to come by. Contrast is inherently infinite, as AMOLEDs keep black pixels off. The Galaxy E7 aced the sunlight legibility test with a record score in the post Nokia 808 PureView era - truly impressive. 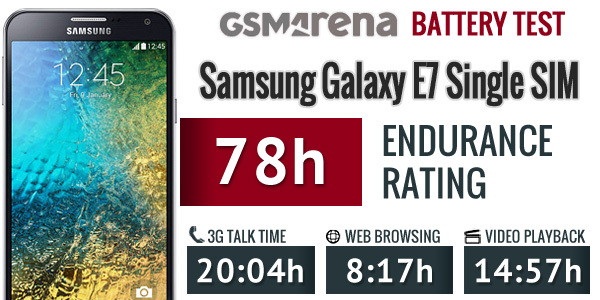 The Samsung Galaxy E7 is quite heavily equipped in the battery department. Its cell packs 2,950mAh worth of juice, as opposed to the Galaxy A7's 2,600mAh. 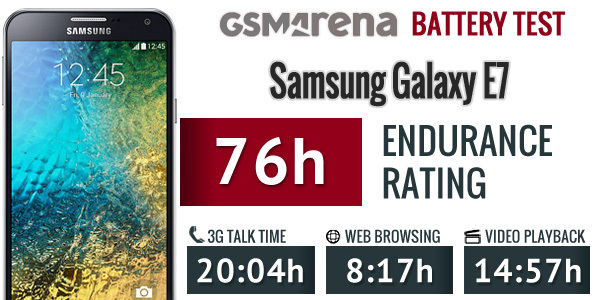 That one managed rather good numbers in the battery autonomy tests, and with less than half the pixels, we should expect the Galaxy E7 to perform even better. It didn't quite turn out like that. While the 15 hours of video playback are remarkable, the 8 or so hours of web browsing are only average. At around 20 hours, 3G voice calls are also on the positive side. We do measure standby times as part of our battery test routine, and while they're not explicitly stated on the scorecards, they are taken into account in the overall score. With a single SIM inside, the Galaxy E7 managed about 12 full days, and that dropped by a day when we popped in a second SIM card. Dual-SIM capability is a key feature of the device. A second phone line is a must-have for some, but everyone else isn't losing anything - they can just put a microSD in the extra slot and go about their business as usual. Even they may find themselves using the second SIM slot though, say a local card while traveling abroad with the main phone number remaining active for emergencies. Anyway, you get LTE-Advanced Cat. 4 for mobile data, in other words 150Mbps worth of downlink and 50Mbps of uplink. You can select a preferred card for calls and which card is used for data, but only SIM1 has 4G and 3G connectivity, SIM2 is limited to 2G only. Mind you, the differentiation is made in software, and it doesn't really matter which card is in which slot. The Galaxy E7 is a dual-SIM, dual-standby device so you can receive calls on one card even while talking on the other. It's not exactly dual-call, as it works by forwarding the call from the inactive to active card, but it has its use cases. This feature can be disabled to help with battery life. Moving on, the phone supports single-band Wi-Fi b/g/n (but no 802.11a/ac) with Wi-Fi Direct and hotspot and Bluetooth 4.0. There's also ANT+ for use with sports sensors, if they don't support Bluetooth. Easy pairing is enabled with NFC support. 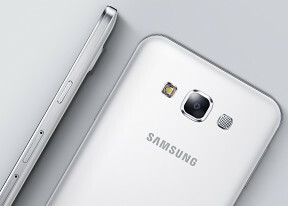 The Samsung Galaxy A7 supports GPS and GLONASS for positioning. The microUSB 2.0 port on the bottom of the phone does not support MHL so there's no TV out. You do get DLNA support for wireless connectivity with nearby compatible devices, and you also get screen mirroring. USB On-the-Go is supported, for connecting peripherals. A standard 3.5mm audio jack can accommodate the headphones of your choice.